The ultimate in versatility, our power clamp drum rotator can lift and tip drums and barrels from 50 to 220 litres. This unit is pneumatic-hydraulic powered and suitable for ATEX areas; gas and dust zones 1, 2, 21 and 22. An airline connection provides air to the system which powers all the hydraulic functions. Our qualified engineers install the lift circuits and ensure they’re fully compliant. We fit mandatory safety features and emergency stops on all of our drum handling equipment to keep you and your operators safe. Each power-clamp drum rotator has a clamp pressure gauge located on the rear panel, operators are able to monitor the clamp pressure during use to ensure the drum remains clamped securely in the head. Burst valves protect hydraulic circuits from pressure drops should a hose be damaged during use. If a large number of drums are being handled each day, our fully-powered model offers a great solution. Operators maneuver the unit up to the drum, clamp the pads securely around the circumference, lift and then tip the contents. The powered functions save time along with reducing manual handling; as such this is a popular drum tilter for high-throughput applications. The flexible pads adapt to the contours of the drums and are able to accommodate a wide range of drum diameters from 280mm to 610mm. The power-clamp pads can be configured to allow drums to be removed from the corner of a pallet. Each gripping head can be tailored to suit your specific lifting application. When handling only 200- to 220-litre drums flexible pads are not required, in this instance we can supply fixed radius pads with a rubber lining. Ackermann rear-wheel steering gives you maximum directional control when tipping drums into your process. The wheels are 160mm in diameter and contain two rubber-sealed (RS) precision bearings, and we fit park brakes on all models. We can also provide you with custom leg configurations along with a power-drive option, should you need them. Our power-clamp unit is universal by design and is suitable for a wide range of drum types and sizes. 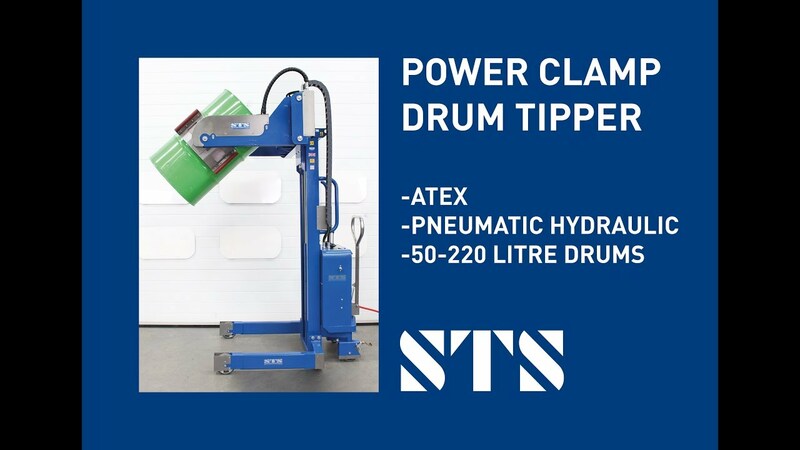 The versatile clamping pads can be provided for handling drums with a diameter range of between 280mm and 610mm; the drum rotator can handle drums of up to 1000mm in height. 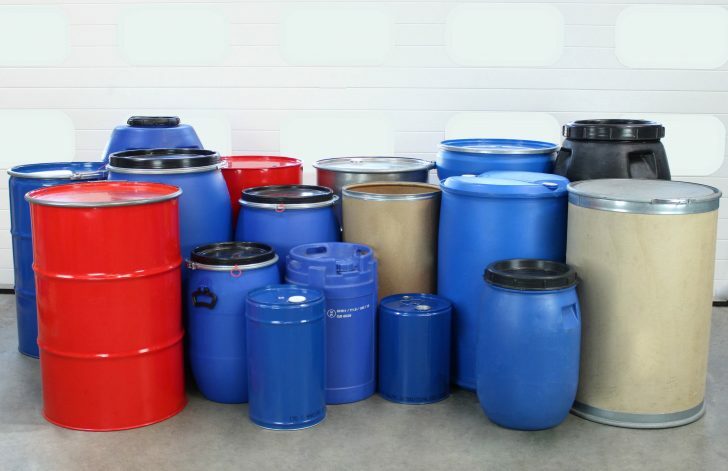 When explosive or potentially explosive atmospheres exist, we are able to supply ATEX compliant drum tipping equipment. Our pneumatic-hydraulic model can be certified for use in Zone 1, 2, 21 and 22 environments. Each of our ATEX drum handlers are designed to ensure electrical continuity, a path to ground is always present. We supply a manufacturer’s EU Declaration of Conformity which states compliance with the ATEX Directive 2014/34/EU. We can provide an ATEX version of this model, suitable for use in an ATEX Zone 1 environment and certified to ATEX Directive 2014/34/EU. We can offer a range of stainless finishes on this product, suitable for clean rooms as well as good manufacturing practice (GMP) areas. When moving drums over long distances you may need power drive. Our power-drive tiller steering offers effortless control utilising a unique pneumatic drive system. Single- and dual-mast models are available, depending on the lift height required. Single masts offer around 1500mm lift whereas telescopic masts offer 2700mm. When machinery integration is critical we can modify leg dimensions to suit your facility. With our load-cell system you can weigh drums while you handle them. A wireless handheld display provides real-time weight information for quantity-sensitive processes. View the instruction manual for our Power Clamp Drum Tipper (Pneumatic), which details how to safely operate and maintain the unit.